It is with great excitement that I share the news that my album Throw a Penny in the Wishing Well has been nominated for a 2014 Grammy® Award for Best Children’s Album! Hard work, perseverance, vision, dedication, trust, patience and a little magic has led me to this moment. From the moment I made the decision to become a musician many years ago, I also made the decision to realize my potential and follow my heart always. This has not always been easy. There have been many challenges, difficult days, months and even years along the journey. But through it all, I always felt a deep inner calling and drive to keep manifesting my hearts desires. The songs in Throw a Penny in the Wishing Wellurge us to follow our heart, trust in ourselves and our dreams, and know that anything is possible. I am savoring every delicious moment of this ride. Thank-you to those who are reading this, who have supported me, bought my albums, have come to my shows and believed in me the whole way! I am blessed and grateful. Now I’m off to do interviews, TV appearances, answer emails, check twitter and facebook messages and send off CD’s. You can watch my recent TV appearance on CBC Montreal by clicking here. My feature appears at 23:55. Or click here to read an article in the Montreal Gazette. Wishing you all a peaceful December and a heart full of love. Feel free to send golden vibes my way! I have submitted a hockey song for CBC’s Songquest contest and I need your help! I just found out I’m close to the top 50 out of 1000’s of entries so a few extra votes could make the difference. Voting is easy. Simply click the “vote for this artist” icon on the page. The song is called “Game in Canada’s Heart.” Listens and likes also count for votes and you can vote daily until December 11th. Thank-you! On Tuesday I had the privilege of being a key note speaker at the Woman’s Arts Society of Montreal’s 120th Anniversary lunch. The topic was “enrich, enlighten and inspire.” I loved speaking and sharing my experience and inspiration with the crowd. I hope to do more of it in the future. Here I am with the president of the society, Cheryl Berganza. She’s an incredible artist and an inspiring woman. Please keep my music in mind for the holidays. It’s a great gift for the little ones in your life. Click here to buy! I wish you all peace, love and light during this holiday season. My Journey to the 2014 Grammy® Awards! Here we are… the seasons are changing and life is changing so fast. I feel like I blink and I am in a totally new phase of my life. The good news is we are always here, now. No matter what is going on in our lives, all we really ever have is this moment. Let’s tap into the gifts of this moment no matter how big or small they may be. 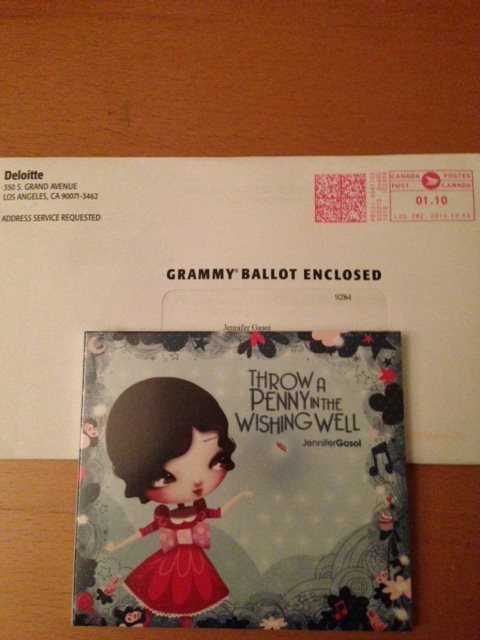 I have some exciting news to share… My album Throw a Penny in the Wishing Well is officially on the ballot for the 2014 Grammy Awards! This means that I am in the running for a nomination for Best Children’s Album! In other news, I will be performing my annual Holiday Show at the Jewish Public Library in Montreal, on Sunday November 24th at 11 a.m. (5151 Rue Cote St. Catherine). I will be joined by my wonderful and talented band. For tickets call: 514-345-2627 ext. 3398.Click here for more info. If you live in Vancouver or in the vicinity, mark your calendars for Saturday April 12, 2014. I will be performing 2 family concerts for the Children’s Hearing and Speech Centre of BC. Click here for more info. Wishing you all a graceful transition into winter. Thanks for reading. The Autumn season is upon us and it is one of the most magical times of year in Montreal. The leaves are turning beautiful shades of red and gold and the air is crisp and energizing. As sad as it is to let go of summer, it’s exciting to see what the new season is going to bring. 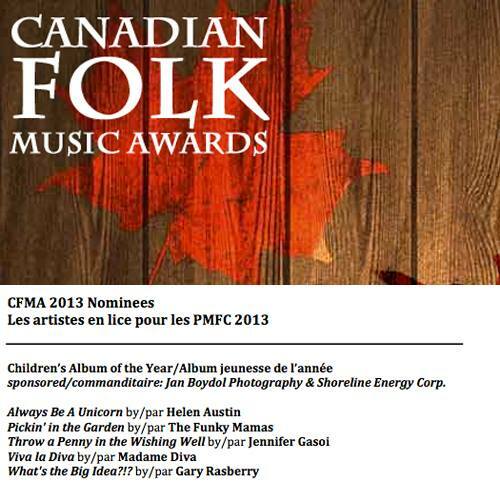 I am happy to share the news that my CD “Throw a Penny in the Wishing Well” has been nominated for a 2013 Folk Music Award for Best Children’s Album of the Year! I’m officially a cross-genre, cross-generational, no rules apply artist! In other news I will be performing my annual Holiday Show at the Jewish Public Library in Montreal, on Sunday November 24th at 11 a.m. Click here for more info. If you live in Vancouver or in the vicinity, mark your calendars for Saturday April 12, 2014. I will be performing 2 family concerts at the Norman Rothstein Theatre, benefitting the Children’s Hearing and Speech Centre of BC. I can’t wait to perform in my home town again and support an amazing cause. Wishing you all a majestic Autumn! Stay warm and cozy and hug the people you love. p.s. I’m including a little video of my recent show at the Upstairs Jazz Bar in Montreal. It was so much fun to play music just for adults for a change!!! Click here to watch the video. I know it’s been a while since I’ve been in touch. I hope you are all doing well wherever this may find you. For my Calgary fans out there, I have been thinking of you and sending prayers and good energy your way. It seems there is a lot going on in the world these days. It can feel chaotic at times. My goal is to stay present and grateful for everything I have no matter what is going on around me. It helps that I get write and play music for you all. Kids continue to amaze me with their joy, wisdom and light. For those of you who live in Vancouver I’m so excited announce that I will be playing two shows in my home town next year! The shows are on April 12th, 2014 at the Norman Rothstein Theatre. The shows are fundraisers for a wonderful organization called the Children’s Hearing and Speech Centre of BC. Mark your calendars! Stay tuned for possible other tour dates around that time. Click here for up to date show info. In case of rain the show will be in the Montreal Forum across the street, on centre ice. I hope to see some of you there! 2013 Juno Nominee for Best Children’s Album of the Year! “Throw a Penny in the Wishing Well” has been nominated for a 2013 Juno for Best Children’s Album of the Year!!! I’m posting from Toronto just a few hours after the press conference! I have already done 10 tv interviews at the press conference. It was wild. More to come. Thank you for all your support. Happy February! I hope you are all doing well, especially those of you on the East coast braving this wild and bone-chilling winter! Over the past few months I’ve been taking time to rest, process, rejuvenate, and create space to vision the next phase of the journey. I’m feeling energized and excited about 2013. January was slow and strange… I felt a bit disoriented as I let go of the old to bring in the new. I found myself having to really ground and keep my feet on the earth. I even joined a Kuduro dance class! (a fusion of African and Cuban dance) It’s been a blast!